“There seems to be no place for some elderly people in our country’s future, and no dignity for them in ageing” (Who Guards the Bodyguards? The Ethics of Care for Older Adults, Ad Maulod). 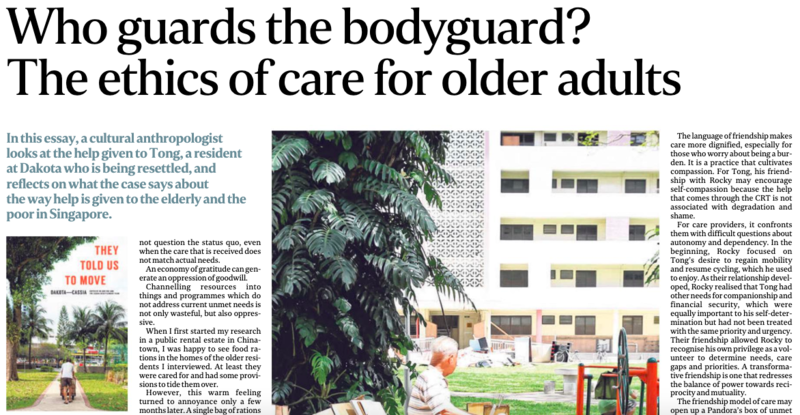 From a policy perspective – and with the intent of helping all elderly Singaporeans age gracefully and successfully, notwithstanding the varied and non-dichotomised definitions of success – the questions which follow the excellent piece about help given to the elderly and the poor (ST, Apr. 7) revolve around the evolving needs of an ageing but underprepared population, the responsibilities of the government and non-profit organisation, as well as the effectiveness of existing programmes and services. More importantly, drawing from the perspectives of those who require help, the caregivers who provide the help, and the organisations which facilitate these interactions, and turning to best practices within and beyond the country, what policy changes are needed to improve the Singaporean ageing experience? Tied to the ageing discourse is the stigmatised but necessary focus on dying and death, in the sense of involving the wider population – including those who are not immediately dealing with a serious illness or approach death, or caring for individuals who are – to consider the types of care and eldercare that they themselves would like to receive. Because it is becoming increasingly apparent that we do not have an adequate understanding of first-hand ageing or caregiving needs, and that we have relied disproportionately on individual family caregivers (which will no longer be sustainable in the future), foreign domestic workers (who are already burdened within the household despite being underpaid), and institutions such as nursing homes (where the elderly are often checked in prematurely, which do not necessarily offer the best living and social conditions, and which was not effectively designed for elderly facing long-term dependency). Besides the emphasis on maintaining self-reliance and on one’s health and fitness – in the form of functional, physiological, and cognitive functions – what are the broader aspirations and desires of an ageing individual? In other words, eldercare should not just be about the minimisation of pain and suffering, but also about the maximisation of joy and satisfaction. The Cassia Resettlement Team and their collaborators have done a great job of gathering and communicating the views of elderly Singaporeans who are struggling to get by – together with the challenges faced by those who are working with these individuals – and the next step would be to coax those who do not belong to the “Pioneer” and “Merdeka” generations to consider these narratives, to contemplate the extent to which they would like to age under such circumstances, and to perhaps envision more meaningful arrangements for themselves. Only then can we confront our subpar care of our elderly and consider a wide range of policy and community undertakings.